The Burj Khalifa. Credit: SOM | Nick Merrick © Hedrich Blessing. I’m on a mission to feature the most amazing projects here on the Construction Industry Podcast. After bringing you the Sydney Opera House, and the Panama Canal, today we will talk about the tallest building in the world: the Burj Khalifa, in Dubai. I’d like to start with this little trivia: the Burj Khalifa is so tall that you can watch two sunsets on the same day. Standing at 829.8 m (2,722 ft), the Burj Khalifa is not only the tallest in the world, but the tallest structure of any kind. The number of records that this project broke is staggering: It is the building with most floors (163), has the fastest elevators in the world (64km/h or 40mph), the world highest nightclub, restaurant… The list goes on and on. When a project of this magnitude is envisioned, designed, and executed, it is obvious that challenges never before encountered will have to be dealt with. As an example, the elevators had to be shaped like bullets in order to help with aerodynamics. 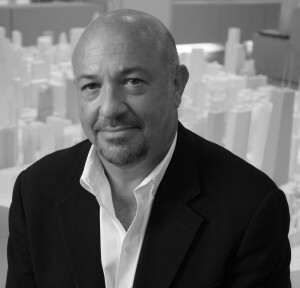 My guest today is George Efstathiou , consulting parter in the Chicago office of Skidmore, Owings, & Merrill (SOM). SOM was the firm responsible for the architecture, infrastructure, interior design, and the electrical, mechanical, plumbing, and structural engineering for the Burj Khalifa. George shared with me the story behind the concept of this project, the challenges faced during construction, and answered a number of questions from our listeners. Check out my interview with George Efstathiou by pressing the orange “play” button above this post. 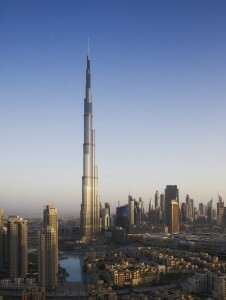 What do you think of the Burj Khalifa? What are your thoughts on the future of large skyscrapers? Have you ever worked on such a unique project that it demanded you innovate on the spot? Thanks, Cesar, for this great interview! A project of this magnitude has many challenges, for sure. As George pointed out, it is not possible to leave anything to change. The construction site is not the right place to solve problems, they must be solved well in advance. If only every project would bear that in mind! @aarnih Aarni, I completely agree. Thank you for your comment and for contributing with your questions! @Alejandro Bernal Thanks Alejandro for your question and for listening. I had a great time talking to Mr. Efstathiou. I always appreciate your input!